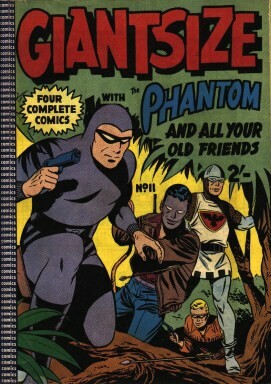 First published by FREW in April 1957, GIANTSIZE COMICs contained a compilation of four or five complete stories about various characters in each issue. 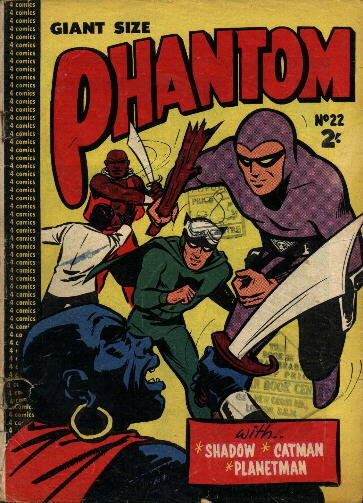 These 92 page comics were published about every two months, and had a cover price of two shillings. 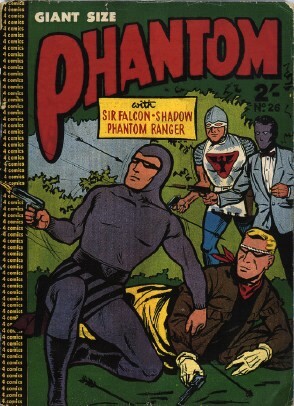 The first story in each issue was The Phantom , and these were backed-up mainly by the Australian-created characters Phantom Ranger, The Shadow , and Sir Falcon . 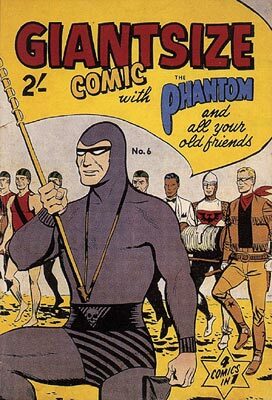 Other characters featured in the series, were Catman & Kit, Planetman, Range Rider, Wonder Boy, Steve Rampart, Phantom Lady (no relation), Kalar the Caveman, Davy Crockett, Robin Hood, Red Wing, Bomb Squad F and Buster Crabbe . 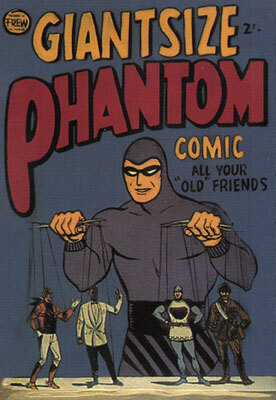 The glossy art-paper covers featured The Phantom teamed up with the three or four other main characters contained in the comic. 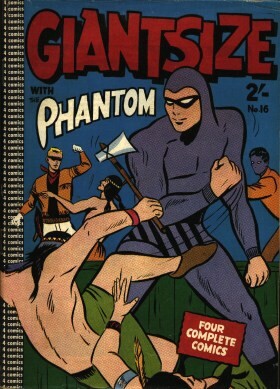 The first two issues of the series were not numbered and could be identified by the following means: #1 was called GIANTSIZE PHANTOM COMIC, while #2 was called GIANTSIZE COMIC WITH THE PHANTOM. 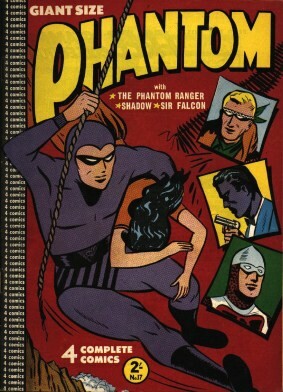 The series ran for 26 issues, with the last edition being published in about April 1961. 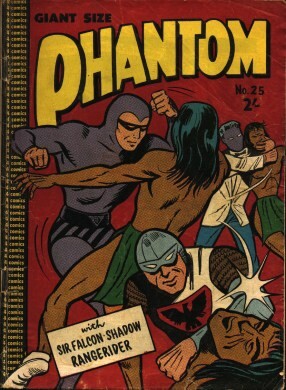 The publisher changed names midway through the series: the first 5 issues were credited to Frew Publications, but from #6 to the last (#26), the publisher was Tricho Publications Pty. 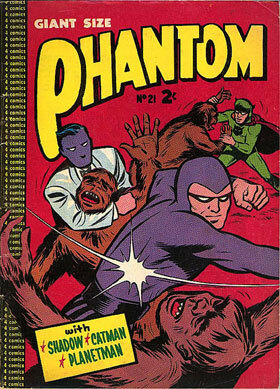 Ltd., of 149 Castlereagh St, Sydney. 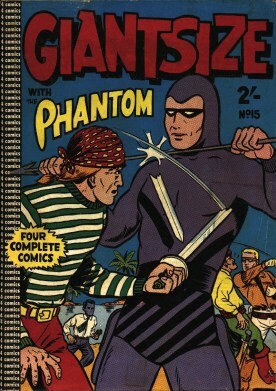 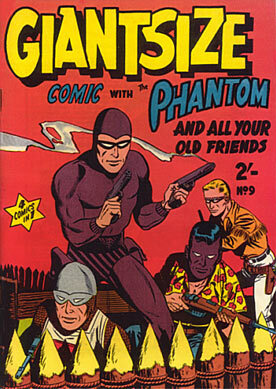 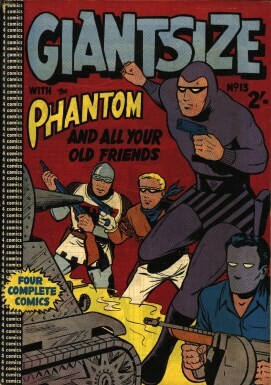 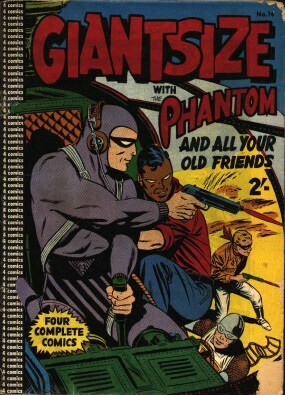 Although the words "GIANTSIZE COMIC" appeared on all of the covers, the main cover title varied throughout the series: #1 "GIANTSIZE PHANTOM", #2-16 "GIANTSIZE", and #17-26 "PHANTOM". 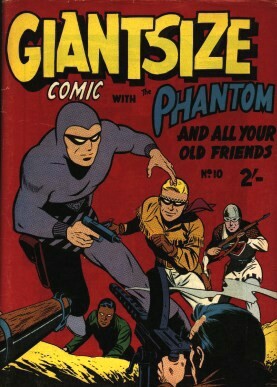 Details of the stories contained in each GIANTSIZE comic are shown in the following table. 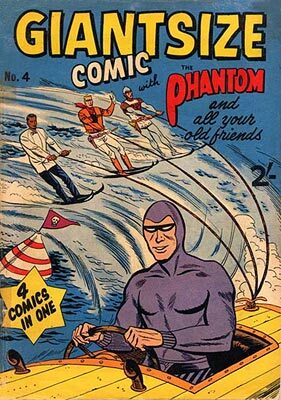 As you can see, I have yet to find full details for this series and if you can help with information, please contact me. 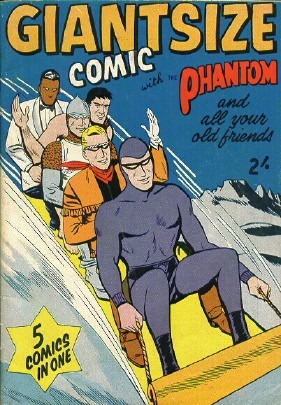 5 The Precious Cargo of Colonel Winn S2 ? ? 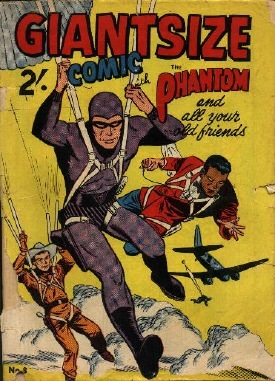 21 The Return of the Sky Band Pt.1 S6 ? ? 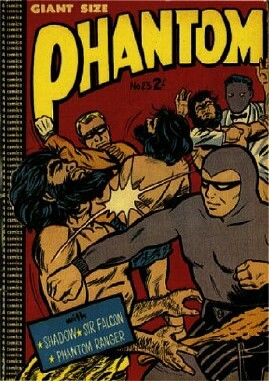 23 The Gray Gang Pt.1 D40 22 The Shadow + ? 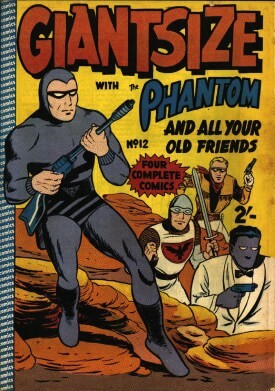 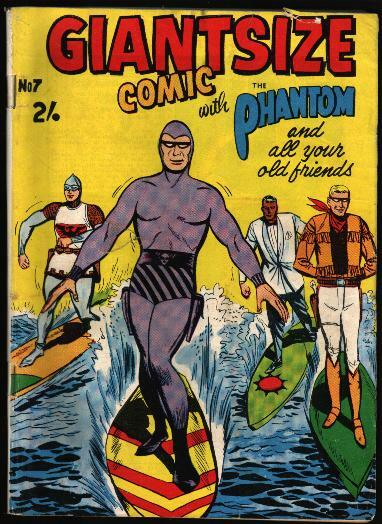 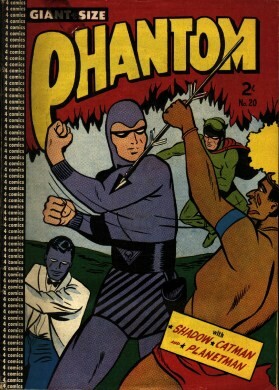 All of the Phantom stories printed in this series had appeared previously in either Frew's The Phantom comics or the discontinued Super Yank series. 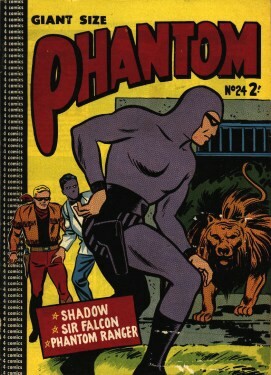 Most of the Phantom stories printed in this series subsequently disappeared from Frew's print schedule and were not to appear again until after 1988 when Jim Shepherd commenced the policy of reconstructing complete versions of the old stories. 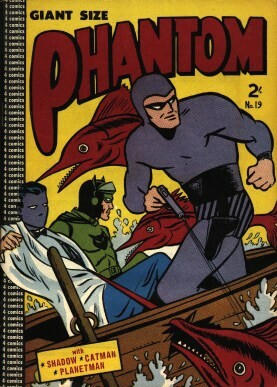 The same Phantom story was printed in issues #1 and #26. 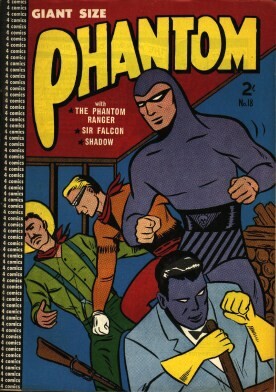 Pt.2 and Pt.3 of The Phantom Goes To War were printed in reverse order. 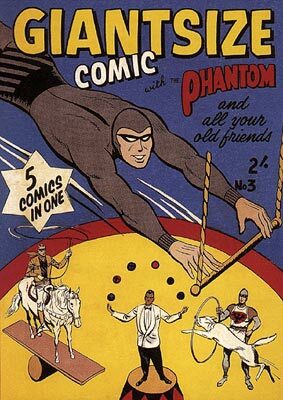 Sincere thanks go to Colin Williams, Les Gray and John Henderson for much of the above information. 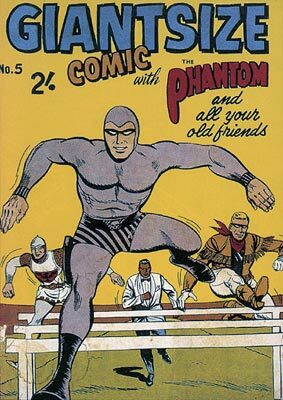 Thanks also to Roger Stitson, Chris Smith, David Budds, Dietmar Lederwasch, Chris Hoare, Will Dorrington, Brandon Mitchell, and N Bain for providing scans.